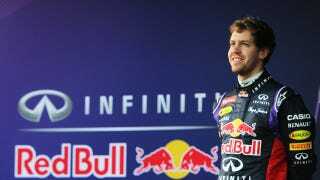 Sebastian Vettel will be leaving Red Bull Racing at the end of the 2014 season, and he could land at Ferrari as rumors swirl that Alonso is on his way out. Here's official word from Infiniti Red Bull Racing. The BBC is reporting that Alonso will leave Ferrari at the end of the season and Vettel will take his place after Ferrari made him "a very attractive offer". Vettel has opted to use a break clause in his contract with Red Bull to end their relationship early. Similarly, Alonso still has two more years on his contract with Ferrari, but the two have reportedly agreed to part ways. The Spaniard's departure has been assisted by outgoing president Luca Di Montezemolo. He asked Alonso if he could give him anything as a leaving gift. The 33-year-old, who has three times in the last four years finished runner-up to Vettel in the championship, asked to be released from his contract. Alonso is rumored to be headed to McLaren, but no deal is firmly in place. Red Bull will promote Daniel Kyvat from the Toro Rosso team to fill Vettel's shoes, driving alongside teammate Daniel Ricciardo. We expected the typhoon Phanfone to be the most excitement this weekend. We were wrong.